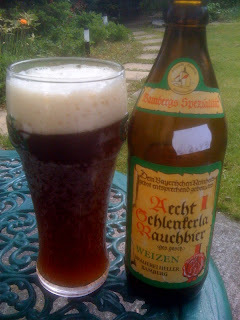 I picked up a bottle of Aecht Schlenkerla Rauchbier weizen in drinkstore recently and on a nice warm sunny afternoon I gave it a go. So a smoked wheat beer huh? Well it was my first. I have had their Marzen before and enjoyed it. The aroma is in your face smoke with a hint of banana and clove that would be typical of a German Weizen. On tasting the beer I got a bit of a surprise. While the Marzen had been a little thin on body, this was thick and much heavier. The banana and clove are stronger when tasting than in the aroma and the smoke is pretty hard to miss as well. I found it very crisp and refreshing with a slight sourness and very nice bitterness on the finish. Over I was quite impressed with this and thought the smoked malt worked very well in this style. The following day I tried my first Jennings beer from a bottle. I previously had only had Cumberland Ale while in Cumbria which was an uninspiring Bitter. This Sneck Lifter poured a clear red-amber with a massive foamy head. The aroma was malty with caramel and a sort of a metalic aroma as well. It put me in mind of Bishops finger so probably similar hops (East Kent Goldings). The taste was quite nice. It was very malty and a little alcoholic. Dark chocolate and bitter hops throughout with a fruitiness keeping itself apparent. The metallic copper taste was there too but in a pleasant way and did not detract too much from the beer. Overall it was easy drinking and perfectly nice, though not something that excited me in any way. Have to say, that although I love their Märzen, I'm not a huge fan of the Rauch weizen, and my colleagues definitely aren't. :D I thought it was interesting, but after having a few of them I found it a bit thin.